Thomas FRENCH (1584 – 1639) was Alex’s 11th Great Grandfather, one of 4,096 in this generation of the Shaw line. Thomas French was baptized 11 Oct 1584 in Bures St. Mary Parish, Suffolk, England. His parents were Jacob FRENCH and Susan WARREN. He married Susan RIDDLESDALE on 5 Sep 1608 in Assington, Suffolk, England. His son Thomas Jr. first came to New England with the Winthrop Fleet in 1630. About 1637, Thomas Sr. and Susan and their remaining children joined him at Ipswich. Three daughters had crossed over to New England earlier. The Rev. Nathaniel Rogers, vicar of Assington, came to New England 17 Nov. 1636, and was pastor at Ipswich until his death in 1665. Four other Assington families came with him, including that of Robinson (N. E. Reg. XLI : 183; XLIV : 400). It would be natural for Thomas French, the elder, to have come over soon after the departure of his noted pastor. Thomas died before 5 Nov 1639 in Ipswich, Essex, Mass. when his estate was administered. 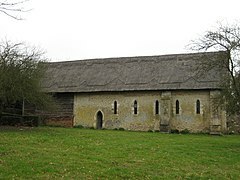 Thomas was baptized in St Mary's Church, a 14th century building in the centre of the village of Bures. Bures is located on the border between South Suffolk and North Essex, in the heart of picturesque `Constable` country and in an Area of Outstanding Natural Beauty (AONB) One of the oldest buildings is St Stephens Chapel which dates back to 1218 when it was dedicated by the Archbishop of Canterbury. It predates St Mary’s Church in the village centre, by some 150 years. Even further back than that, history tells us on Christmas Day 855, Bishop Humbert of Elmham anointed a 14-year-old boy as King of the East Angles. The boy was Edmund, the chosen heir of King Offa, and his coronation was documented at `Burva`. The chronicler Galfridus de Fontibus also described the coronation as having taken place at “Bures”, which is an ancient royal hill. It is the general belief that this was the lonely hilltop, where St Stephen’s Chapel now stands. 1. Thomas French Jr. bapt. 7. John FRENCH Sr. bapt. Thomas’ father, Jacob French, was born about 1553 in Assington, Suffolk, England and died 11 Nov 1615 in Assington, Suffolk, England. Bures in on the border of Essex and Suffolk along the River Stour. Jacob moved to the northern, Assington part of the area about 1585. Bury was mostly owned by the Gurdon family and Thomas lived on a farm in Assington called Garlands which was owned by John Gurdon. Thomas’ mother, Susan Warren, was born in 1555 in Assington, Suffolk, England. Susan’s father John Riddledale was baptized 27 Sep 1557 in Boxford, England. He was buried 4 Jun 1629 in Assington. 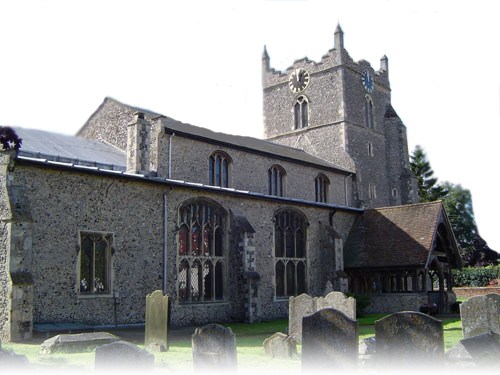 Her mother Dorcas was buried 24 Sep 1624 in Assington, Suffolk, England. On 3 January 1613/14, John & Dorcas Riddlesdale, sold a ten acre close, two others of five acres and one of two acres to John Gryme the elder of Assington and his wife Faith for £120. All were pasture and lying in Assington. On the same day, Dorcas Riddlesdale released her interest in land leased in June 1555 by John and Robert Gurdon for 500 years to John Vigorus the younger, clothier of Langham, Essex, England. Perhaps John Vigorus was Dorcas’ grandfather. John Riddlesdales burial record at Assington states that he was of Bures. He may have, and probably was, living with one of his children at his death; But he was buried next to his wife at Assignton. 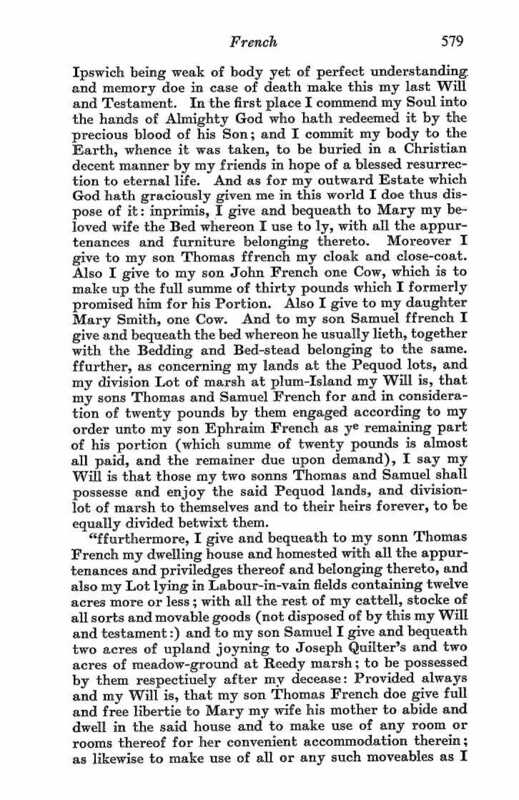 The administration of the goods of Thomas French, deceased, is comited to his wife, & the land w** hee left is to bee disposed of by sale, or otherwise, by advise of the Magistrats of Ipswich, for the maintenance of his wife & education of his children, w°h are not yet able to pvide for themselves, nor were disposed of in their fathers life. His administration indicates that he had children over the age of 21 years in 1639, and also children who were minors, and under the care of their mother. 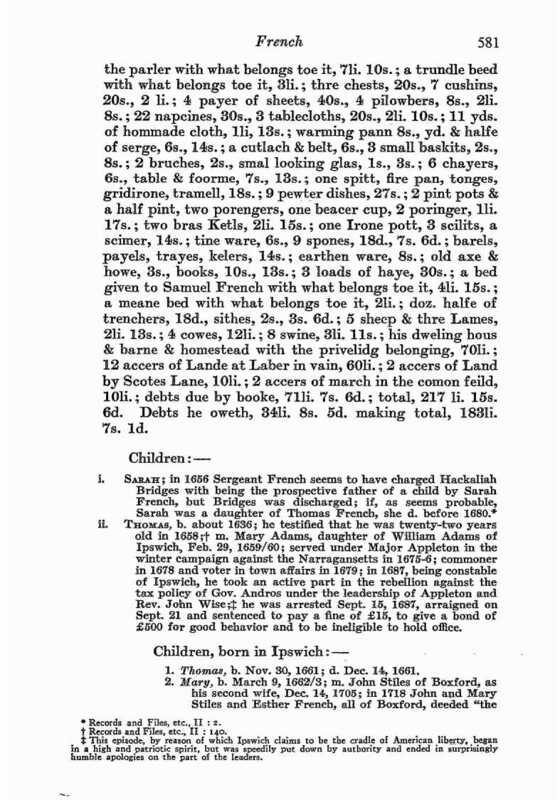 Inventory of the goods of Susan ffrench widdow of Ipswh deceased taken 10th of March 1658. (No land mentioned). This Inventory reed in court held at Ipswich the 29 of March 1659 . . ., amount £12.11.6. The wrapper of this old paper has ” Susan French . . . widow of Joseph ” but there is no mention of his name on the original paper. This writing is in another hand. It is possible that the expression “Susan French . 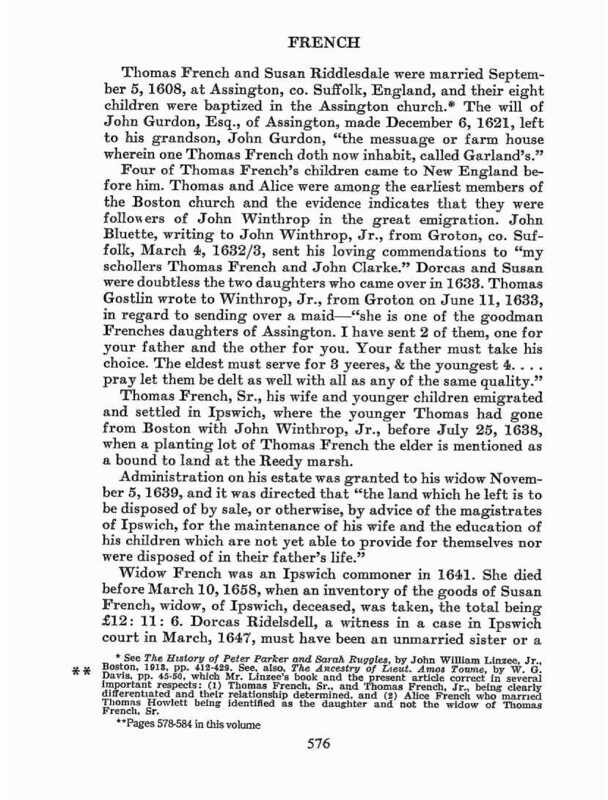 . . widow of Joseph” arose from a careless reading of the abbreviated name “Ipswh ” as Joseph; no Susan French widow of Joseph was found in Essex Co. Mass. as early as 1658 or even later; but Joseph French, Son of Edward and Ann French of Ipswich and Salisbury, married Susanna Stacye about 1653, dau. of Simon and Elizabeth ( ) Stacye, she died 16 Feb. 1687-8, and he died 6 June 1710; therefor, she was never a widow, she cannot be the Susan French widdow who died in 1658, neither does there appear to be any error in the death record of the younger Susan French. Thomas’ wife Mary Scudamore was born 1612 in Gloucestershire, England. Her parents were William Scudamore and Frances Lechmere. Mary died 6 May 1681 in Ipswich, Essex, Mass. Thomas came to New England with the Winthrop Fleet of eleven ships carrying about 700 colonists, which sailed from Yarmouth, Isle of Wight, in April and May, 1630, and which arrived in June and July following. The first of these ships landed at Salem on 13 June. 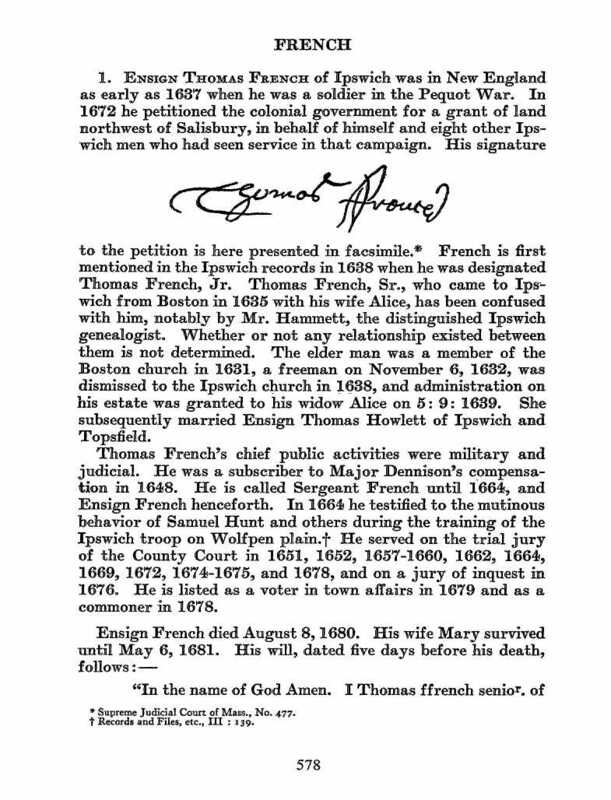 Thomas French first settled in Boston and presumably was married there about the next year, 1631. He was member #128 of the First Church of Boston. 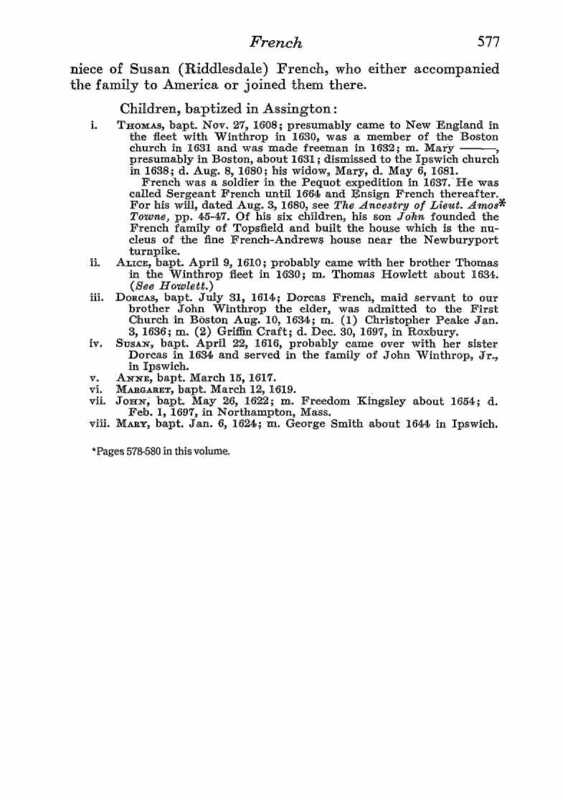 His wife is identified only as Mary, though she may have been Mary Morton who appears on the list of original members of the First Church of Boston, as was Thomas French, and then is heard of no more. Thomas French was made a freeman of the colony on 6 Nov. 1632. John Bluette wrote to John Winthrop Jr. from Groton, Suffolk, 4 Mar. 1632/3 and sent his loving commendations to “my schollers Thomas French and John Clarke.” About 1634 he moved to Ipswich and appears there on record first in 1635 in the following land records. 20 April 1635 – There was Granted to Thomas Scott…Likewise an hous lott in Mill Streete havinge Thomas French on the Southeast. 20 April 1635 – There was Granted to Robert Mussey…likewise an hous lott in Mill Streete lyinge betweene Thomas French and Richard Jacob. 20 Feb. 1636/37 – There was granted to Serg. French ten acres of upland at the hither end of a Neck lying beyond Reedy marsh, to be laid out by the lott layers. Granted to Serjent French, a parcell of upland and medow containing about three acres on the South side of th River, adjoyning his planting lott. From these we know that his house was on Bridge Street just off Mill Street. About 1637 his parents and his younger brother and sisters joined him at Ipswich. Three sisters had crossed over to New England earlier. This proved in court held at Ipswich 28 of Sept. 1680 to be the last will … of Ens: Tho: ffrench by the oath of Mary Frenchand Samuell ffrench . . . Dated Agust 3: 1680. Alice probably emigrated to America with brother Thomas. She was member #142 of the First Church of Boston, admitted in 1632. Alice was dismissed from the Boston church to Ipswich Jun. 16, 1644. Dorcas’ first husband Christopher Peake was born in 1605 in Thorpe Achurch, Northamptonshire, England. His parents were Boniface Peake and Joan Clarke. Christopher died 22 May 1666 in Roxbury, Suffolk, Mass. Dorcas’ second husband Griffin Craft was born 21 May 1600 in England. He first married 1628 in England to Alice [__?__] (b. 1600 England d. 26 Mar 1673 in Roxbury, Suffolk, Mass.) Griffin died 4 Oct 1689 in Roxbury, Suffolk, Mass. Dorcas came to New England in 1633 on three year service as maidservant to Elder John Winthrop. She was admitted to First Church in Boston, 10 Aug 1634. Dorcas ended her apprenticeship in 1636, the exact date that she married Christopher Peake in Roxbury. Susan immigrated in 1633 to serve as a maid to the Younger John Winthrop for 4 years. No more known. (Mass. Hist. Soc. 5th Series, I :200-1) Letter of Thomas Gostlin to John Winthrop Jr.
Loving Cosen . . . but for carpenters I could get none, nor husbandmen, such as weare fit for you, but as for maydes and a girle I could haue sent you enoug yf my brother Downing would haue payed for the passage, & therefore I haue sent you but one, because at this time I am shortned for mony, and Mr. Peerse would be payed downe, & would haue no lesse than fiue pound a passenger besydes 2s 6d for the surgion, which I left with your vncle Downinge for him. She is one of the goodman Frenches daughters of Assington. I haue sent 2 of them, one for your father, and the other for you. Your father must take his choyse. The eldest must serve for 3 yeeres, & the youngest 4 … I praye let them be delt as well with all as any of the same quallity. Groton this 11 June 1633. Mary’s husband George Smith was born in 1620 in England. George died 30 Mar 1675 in Ipswich, Essex, Mass. Mary and George’s daughter Sarah Smith was born 1645 in Ipswich, Essex, Mass. She married 9 Nov 1664 Ipswich, Mass to John Newman, son of Thomas NEWMAN Sr and Alice MADDOX. This entry was posted in 13th Generation, Historical Church, Immigrant - England, Line - Shaw and tagged Ipswich. Bookmark the permalink. Okay, I think I have seen that name John French before on a Ancestry Family Tree , I was trying to found out . But it is happend for a long time ago. So maybe I can try to Search again on Ancestry.com and find out of it there later. Of course I am very interested . Yours sincerely. Mr. Magnus Torstein Jogvanson Johansen from the litle village Ejde in Faroe Islands. Jewish Descendant of Benedictus Baruch Goldsmit. And also Anglo/Jewish Related . Thank you I am a paternal descent from Jacob French and Susann Warren. It is my goal to connect the Warren line with documentation as it lead to Warrene Plantagenet lines. I would like to hire a researcher who would be qualified to give this a try. Very interesting read. I am also related -paternal descent from Jacob French and Susann Warren. I had initially only researched to Robert Smith and Mary French but of course, it is difficult to stop! Wondering how your search has gone Brian French?